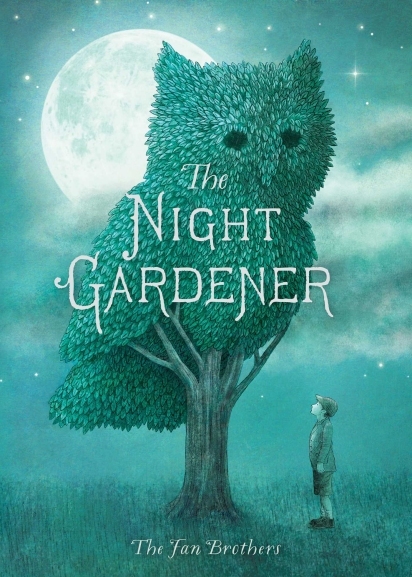 The Night Gardener by Terry and Eric Fan. Not since the Brothers Grimm have two brothers collaborated in such a way to produce a book with such magic, mystery and intricate story weaving. 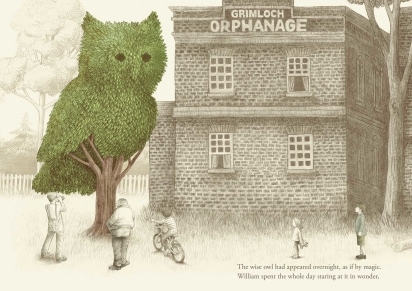 The action takes place in Grimloch Lane, when a topiary terrorist works under cover of darkness to produce magnificent creatures of the purest privet, to bring together a community. It teaches the residents to look for the extraordinary in their ordinary lives, to dream and to create their own miracles. Canadian brothers Terry and Eric Fan have created an enormously detailed work in the illustrated pages, where splashes of colour appear as the magic is unleashed and the story unfolds. If there was once a golden age of illustration back in the 1880's, with beautiful works like those created by Arthur Rackham and Kay Nielson, then we must certainly be heading into another era where meticulous detail and rampant imagination rule. It seems the darker and more uncertain our real lives become, the more need there is for opulent and optimistic picture books to reassure us. The story unfolds softly and slowly. 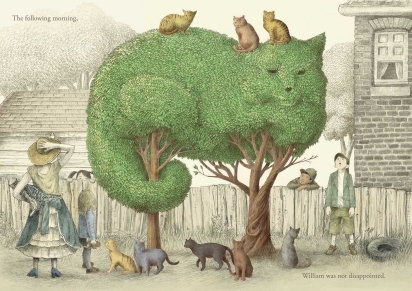 Orphaned William discovers that his town is being transformed overnight by the mysterious night gardener, who clips and snips the trees and bushes into an ever more extravagant menagerie of creatures. His curiosity causes him to find out who the night gardener is and he slowly learns to use his own artistic talents, to pass down the craft. There is a strong message here, that art unites people, it breaks down barriers, provides a talking point and brings people together in a common appreciation. Although the text is simple, it still works equally well without any words at all and is perfect as a book to share with smaller children. This is the brother's first venture into publishing and I love the way that each artist has collaborated to create a style where the sum is better than its separate parts. They have produced an excellent first book, with its large double spread illustrations and clever divides of day and night scenes. 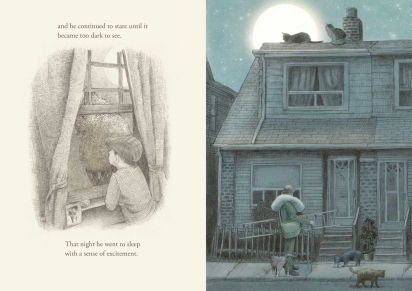 The Night Gardener would grace any bookshelf and is just perfect for kids 0-12 and the adults who love them.